Love this projector. Like other reviewers we also used it for outdoor movie night. Great picture quality. Had plenty of cable hook up options to keep my husband happy and we had a fun outdoor movie! Dimensions 8.0 In. X 7.0 In. X 3.0 In. It was just what I was looking for. The price was right and It’s great for my outdoor pool area. We also purchased an inexpensive screen and now enjoy our dive in movie nights. There’s not a lot of instructions or information about setting it up. Just trial and error, but it was simple to get the size and picture quality that we were looking for. I’m giving it 5 stars so far. We’ll see how it holds up and how long it last. Very happy with my purchase and the timely delivery. I would recommend this product. I purchase this projector because cause It was affordable and have a built in speaker.This projector was easy to setup up and the picture is nice. No complaints. 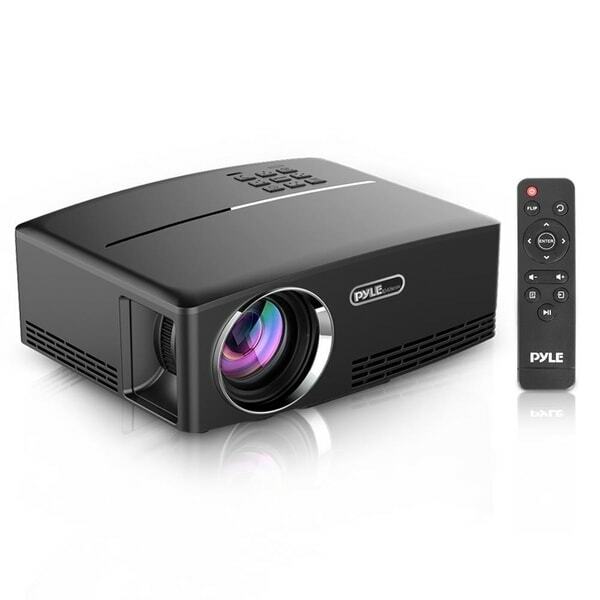 This Pyle Compact Projector brings my viewing experience quite simply when I plug in my Amazon Fire Stick to the HDMI port. The speakers are plentiful in normal indoor environments. The color is clear, and no distorted. Of course, there may be brighter projectors, that compete with the led television clarity, and although this is not nearly as clear as the tv, it is definitely clear enough for relaxing and enjoying movies or binge watching. Reliable, clear sound, clear image, simple to function. I haven’t used the projector screen with it yet, so that will likely add much more clarity than this review which only describes my experience using it on my wall. Overall, I’m pleased with this purchase and would buy again. We love this projector, after reading reviews and searching online, I found this projector and decided to give it a try. I am so glad we did! The projector has a very good picture quality and the colors are vibrant. I recently used the projector to stencil a picture on the wall at a local cafe. We are looking forward to using the projector for outside movie nights once the weather will allow us to do so. I highly recommend this projector! I was truly skeptical about this projector because I did think that the quality of the projection would be good but this has truly surpassed my expectations. We had gotten a lot of use out of it and it’s a great projector for the price. 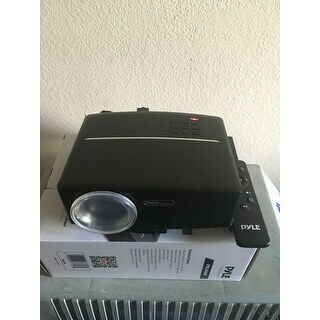 I gave it a 4 star review only because the picture quality could be improved but if your looking for a projector for the family at a great price this is it. Nice product, works great . Great product with a wonderful picture quality. The sound could be a bit better but for the price, we will use a separate system to increase the volumn. Overall I would recommend. I bought this as a gift for my son, and he loves it. He says it is easy to use, and it has a great picture. "Does this projector view image in wide screen only or square like a tv"
"Does this have Bluetooth capabilities for if we wanna add wireless speakers? " "Can i make the screen smaller or bigger by adjusting it some kind of way and if so, how do i do that? I had to put the projector in one spot, which was on top of a box and i couldn't even adjust the screen size." Invited to speak at events frequently and some venues do not have the technical support to project PowerPoint slides. The price and the size I hope it works for me this is my first time using a projector.